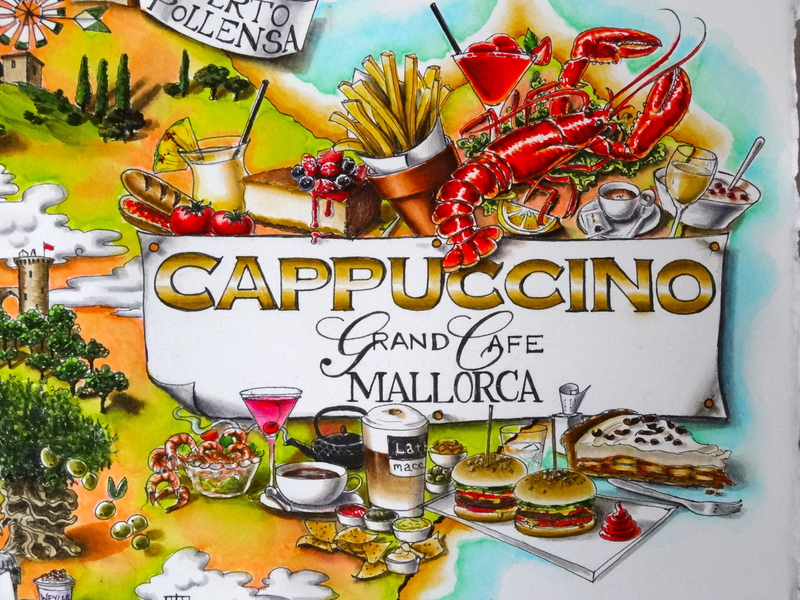 I never made a secret of the fact that I love Cappuccino Grand Cafe, the expanding café restaurant business which has taken the island of Mallorca by storm and is now gradually expanding across the sea to Ibiza, mainland Spain and the Middle East. In fact my love affair with the cafe, which begun in their sumptuous beachside Marbella branch, first manifested itself in my painting of Norms dining at Cappuccino Marbella, a painting which was later featured in their first issue of the Cappuccino Grand Papier, the suitably glossy homegrown publication which was published in May. 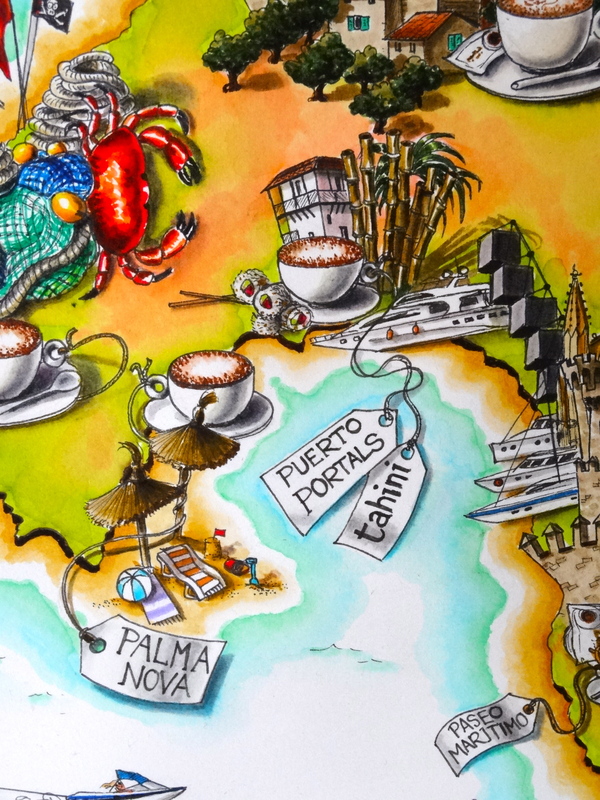 Imagine my excitement then when Cappuccino then commissioned me to hone both my artistic skills and my love for the café by illustrating a series of maps of the cafés across Mallorca and its elegant capital, Palma, to be featured in Cappuccino’s second magazine this summer. Excited, I boarded a plane from rainy England to the sun drenched Balearics at the end of last May so that I could properly research each and every detail of the many Cappuccinos the island has to offer. I’d be lying if I said it was an arduous task, exploring as I was not only the many stunning and unbeatable sites the cafe inhabits across the island, but also sampling their rich and varied continental menu in each location. Full of ideas, I returned home to the UK in earnest, opened up my large drawing board, and got to work. The maps were not easy. 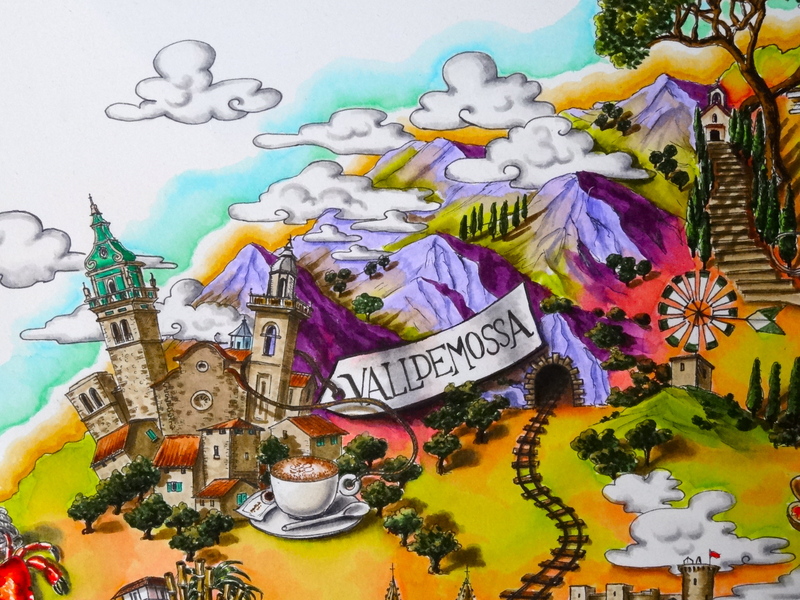 The level of detail required to properly represent the various cafe locations as well as the Cappuccino brand and all its food took many painstaking hours of work over a series of several weeks. But I was delighted with the results. Yet despite finishing my maps back in June (and July for Palma – check that one out tomorrow), they’ve been the art world’s biggest unveiled secret until their publication in the Second Edition of Cappuccino Grand Papier this August. And now, finally, I can unveil the maps to you in all their many details. 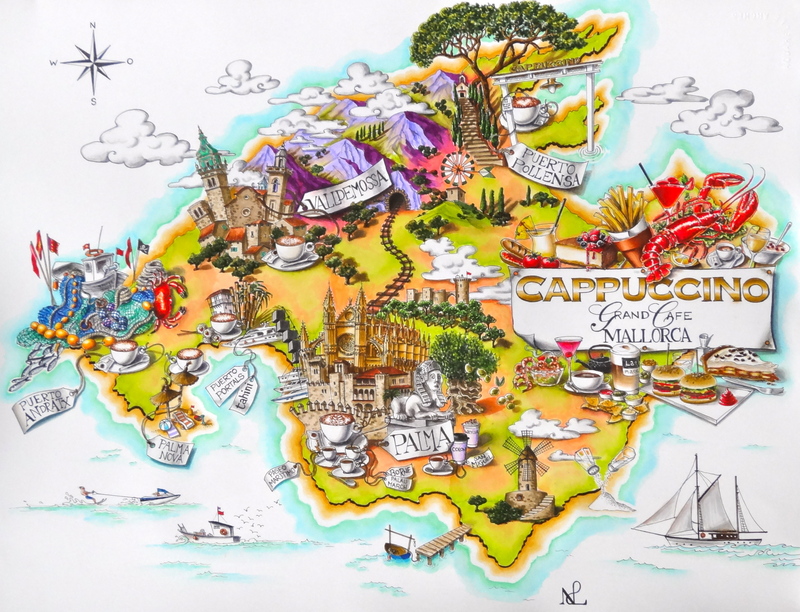 On today’s post I present my map of Mallorca, the idyllic Spanish island from where Cappuccino Grand Cafe was born, and with whom the Cappuccino brand is now synonymous. 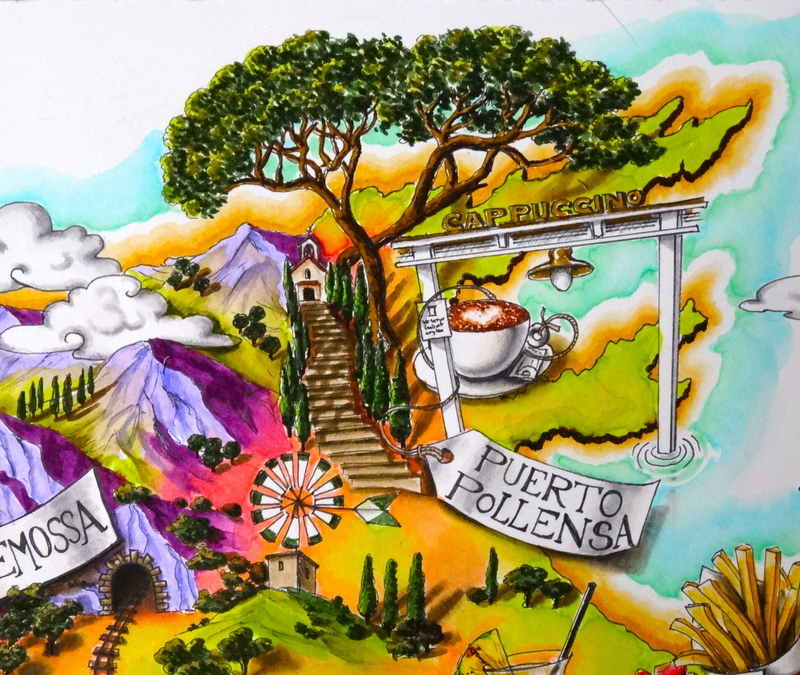 With branches in the Port of Pollensa, the Port of Andratx, Puerto Portals, Palma Nova, Valldemossa and a great many more in Palma itself, there was plenty of detail to capture on my map. 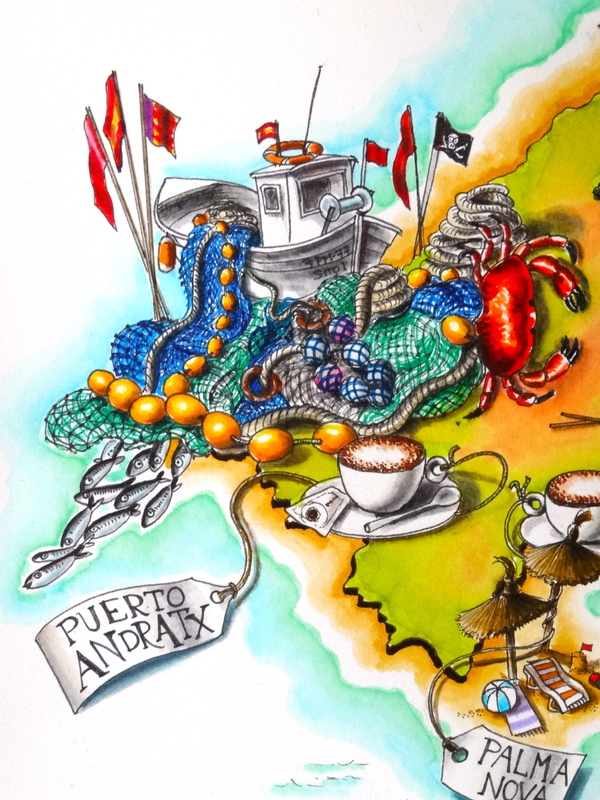 Using icons which characterise the various locations across the island, such as the famous Real Cartuja monastery in Valldemossa (where Chopin and George Sand famously spent a miserable winter), the sumptuous pine trees of Pollensa, and the fishing nets of Andratx’s fishermen’s port, I packed my illustration with both geographical indicators, and of course that all important coffee cup symbolising the location of the cafés. 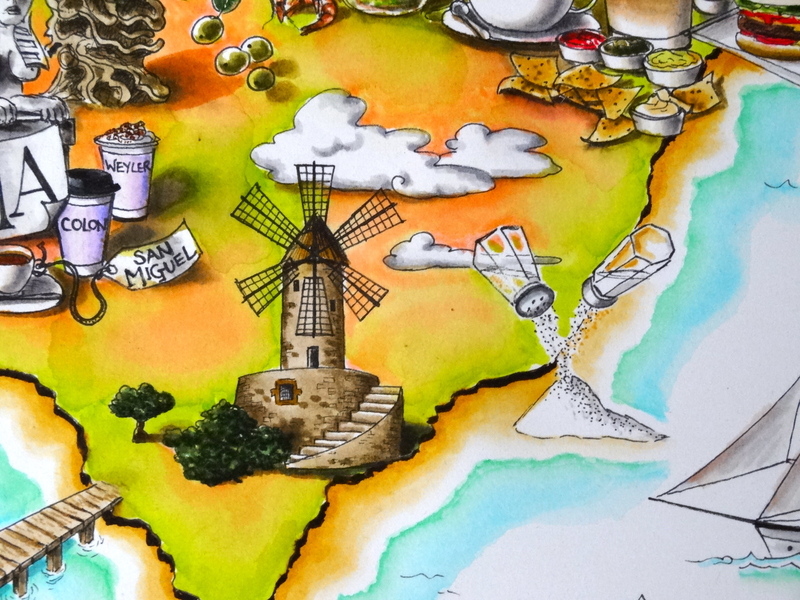 Meanwhile for the map’s title, the brand of Cappuccino is surrounded by a glorious cornucopia of some of the chain’s most iconic offerings, from classic cocktails to its irresistible creamy banoffee pie. And such is the pace of Cappuccino’s current expansion that even while I was designing my map, two new cafes were opened on the nearby island of Ibiza. So a small bolt on map of Ibiza was to follow, including the two new cafes which are perfectly located on the waterside of the island’s stunning Marina Ibiza. So without further ado, I leave you to check out the maps. 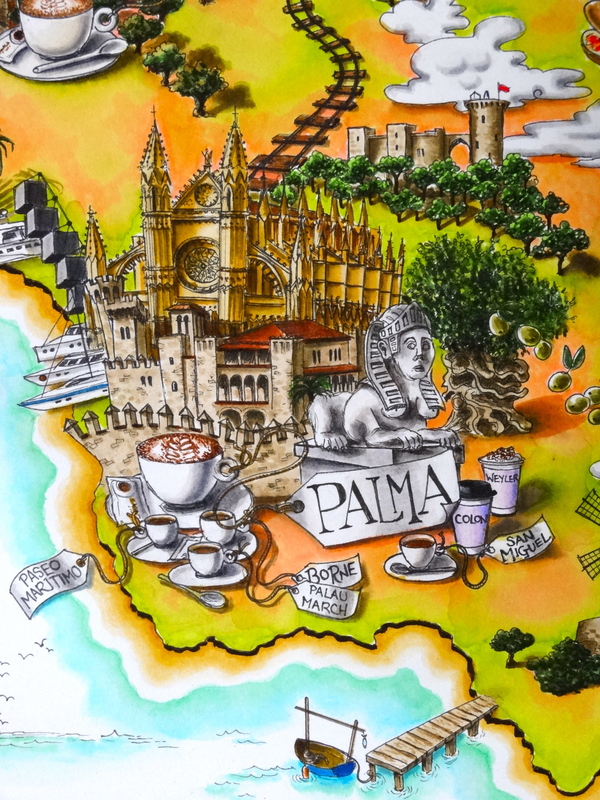 Return to The Daily Norm tomorrow, when I’ll be profiling the second of my Mallorca maps – a focus on the beautiful capital city of Palma. In the meantime, you can see the maps in all their magazine glory in a digital version of Cappuccino Grand Papier. Take some time to flick through – it’s a great magazine! This is amazing! ! I love it, great work! Not only you care for the details and information, but the beauty of the result. The lilac maountains… just love them.